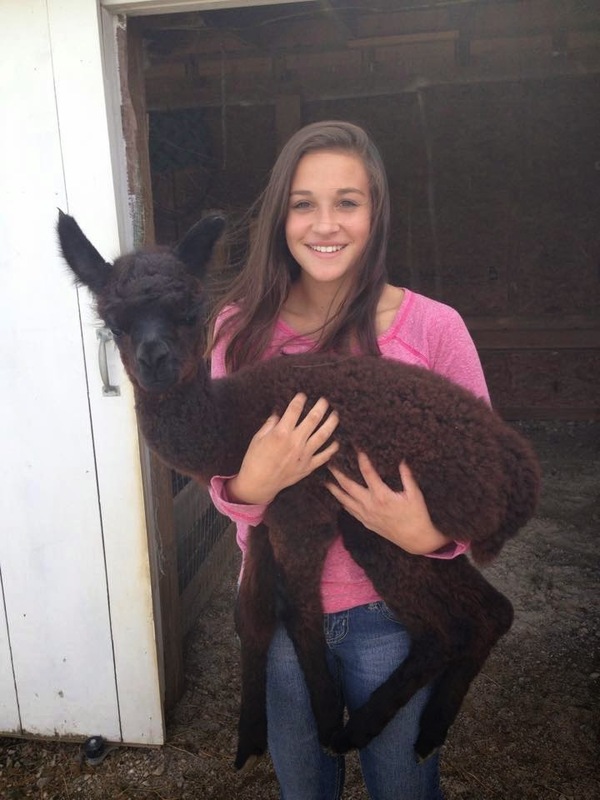 Buckeye Star Alpacas: Farm Friends! With National Alpaca Farm Days just a week away, we have put special efforts into our farm decorating this year. I still have some work to do in the store; tagging some new yarns and painting some small wooden items but, I must say that we certainly look festive. We have some advertising placed in a couple of local newspapers later this week to invite the public out for a little "alpaca education." This weekend, though, we have been lucky to host friend and family members on the farm for a sneak peek at our new baby, Mocha, and the rest of the herd. My sister, Laurie, and brother-in-law, Steve were up yesterday bringing Greek carry-out food for our lunch. It was a breezy and sunny early fall afternoon; perfect for a foray into the pasture to feed treats to the alpacas. Mango and Took enjoyed the sweet feed treats almost as much as Rich and I enjoyed the Gyros! We always enjoy spending time with Steve and Laurie. Earlier this week Olivia had texted me that her bff, Savannah, wanted to bring a friend up because he was fascinated with alpacas. When Rich and I went down to watch grandson, Max, play football on Wednesday, Olivia and I discussed the visit and set up a time for her to bring her friends. We were expecting the kids around two. In the meantime our good friends, Athena and Jim, called to say that they were nearby and would like to stop. They had been out and about with their beautiful granddaughter, Madi, an animal lover, and she wanted to see the herd. Our yearlings, Brutus and Asterius, put on a good show as they always do. 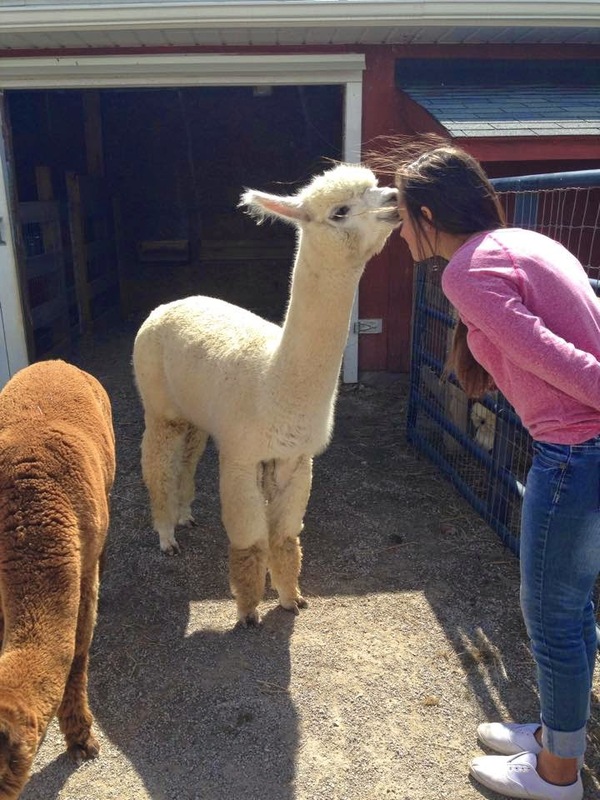 Asterius is always ready to give alpaca "kisses" to pretty girls (or anyone else for that matter) and Madi, of course, received a sniffer! But I think that the highlight of her visit was probably when Madi actually got to hold little Mocha (who is now up to 20 pounds) in her arms. It made one of those unforgettable moments and a lovely picture. Pretty girl, pretty baby! Olivia and her friends arrived as we were standing in driveway saying our goodbyes to Jim, Athena and Madi. I always like to have an opportunity to introduce my own beautiful granddaughter to friends. Olivia and Savannah have been friends since kindergarten. They are both juniors in high school now, attending different high schools, and are closer than ever. We haltered up the Brutus and Asterius and Savannah and her friend, Max, also a junior, got to take them out for a little stroll around the yard, after which we gave the little guys their annual CDT booster shots. Savannah got her kiss from Asterius. Max arrived on the farm already curious about alpacas. He seemed to have a natural instinct when it came to handling them and I think he would have taken our Brutus home with him if he had any place to house him in the city! We assured him that he is welcome to return any time for a visit. I'll even teach him how to give shots, trim toenails and shovel the alpaca beans! Ask any grandmother and she'll tell you that visits from the grandchildren give us so much happiness. Today I learned that when a teen aged granddaughter wants to come for a visit and bring her friends along it just compounds the joy.